At some point in your life you will need to know how to get rid of bad karma. Good karma and bad karma are invisible powers that shape your life. Karma teaches us. It changes the course of our destiny. It directs all things as we move through life. Good karma and bad karma come from the actions we take. These good karma and bad karma have reciprocal consequences later in life. Not only does that mean our future is dependent on our actions today, but it also means our present reality is caused by karma created by our past actions. That’s why you need to know how to get rid of bad karma from your past: because you do not want bad karma from your past to ruin today or tomorrow. Have you ever noticed how your present reality is a reflection of your past? That’s the nature of karma. It’s the cyclical nature of existence. So what do you do about it? How do you get rid of bad karma and start to build good karma? There are a lot of different definitions of karma, just as there are different definitions of most spiritual words. That’s because karma is discussed in so many different fields. There’s karma yoga, which advocates devotion to selfless actions [this is done by being one with the divine (Bhakti). There’s Buddhist karma, which teaches that every intentional thought, feeling and action will bear fruit (ripe or sour) in the future. Hindu karma teaches that beneficial present day occurrences are the result of good deeds done in the past. And then there’s the pop-culture karma, which is basically the idea that what goes around comes around. We can use all these definitions to hep us get rid of bad karma and start to build good karma. Let’s combine all those different understandings into one definition of karma. Karma is the idea that every action has a reaction. Which is very similar to the physics rule that every action has its equal and opposite reaction. If we did a good deed in the past, something good will happen to us in the present. Imagine you’re standing on top of a clock. You place a nice present on one of the hands. The hand goes round. And soon enough, the nice present you put on top of the clock has come right back to you. #karma. So what is good karma? It’s the positive actions you’ve taken, the nice things you’ve done. And what Is Bad Karma? Bad karma comes from the times you’ve done harmful things in the past, and the karmic price you pay later on. But don’t worry, there are ways how to get rid of bad karma. Karma is actually a Sanskrit word that simply means deed or action. It’s also a word used in Buddhism. In Buddhism it means to take responsibility for our actions. Karma is the idea that there is a consequence to every action. The karma law is simply cause and effect. It’s as simple as that. It’s the idea that you get what you deserve based on your past actions. Obviously that law is very questionable. What the hell has a starving African done to deserve to starve? Nothing. So how can you explain that using the law of karma? We’ll get into that a little later. Or, if you have your own answer, leave a comment. Karma isn’t about punishment or reward, though. It’s not the pop-culture idea that you reap what you sew. It’s actually about learning. Based on past actions, life creates the experiences that you need in order to develop. But this is a two-way street. Because if you change your actions now you will change your future. It’s about considering the present moment. Ask yourself, what did you do in the past that created your reality today? And how can you learn from that in order to create tomorrow? Lots of people party too hard in their teens and early twenties [I know I did]. Life (karma) then teaches them that those actions can have negative consequences (lack of career, illness). So they learn from that in their late twenties / early thirties and change their ways, becoming more responsible. That’s a very common example of karma. What do you think happens when you die? (Leave a comment and remember to subscribe to our newsletter). Different spiritualities and religions believe that different things happen when we die. And most of those beliefs come back to karma. Christianity is the very obvious example. You’re either good or bad while you live. And after you die, karma leads you to heaven or hell. That’s why Christians try to get rid of bad karma when they get old. Other religions and spiritualities share similar beliefs?. Buddhists and Hindus believe we are doomed to repeat the perpetual cycle of life and death until we achieve enlightenment. Enlightenment is ultimately about having a pure spirit when you live. So again, we can see how karma, and either living good or bad, effects our destiny after we die. We have all made mistakes in the past. Let’s just put our hands up in the air and admit that we’ve all messed up, yeah? It’s the truth. So, if we have all messed up, what is the difference between a good person and a bad person. The difference is whether we intended to harm or not. Imagine you’re driving late at night. You’re not speeding. You haven’t been drinking. You’re doing everything right. Then a kid runs in front of your car. There’s no way you can stop in time. You hit them. Are you going to get bad karma from that? You didn’t intend to do wrong. It isn’t really your fault. You’re actually a victim of unfortunate circumstances. You intentionally cheat on your wife. She finds out. She’s devastated. Will you get bad karma? Probably. Because you did it on purpose. But remember there are ways how to get rid of bad karma. We’ll look at those in a moment. The amount of bad karma you’ll receive is proportionate to the harm you do multiplied by your level of intent. You very intentionally cheat on your girlfriend and there is no justifiable reason for it. Harm = (for example) 7 (out of 10). In this instance, your bad karma is quite high (7 out of 100) because what you did is quite harmful (though there are obviously far worse things a person could do). And at the same time, you had 100% intent and zero excuses. So sorry, you’re going to get bad karma for that. Lets compare this to our example of accidentally hitting a kid. Harm = 10 out of 10 (you’ve killed a kid). Intent = 1 (maybe you could have been more alert, but ultimately it is really not your fault). So interestingly, you’re really not going to get a lot of bad karma for this because even though what happened was terrible it really is not your fault at all. This also works for good karma in the same way. Good karma is based on the good you do multiplied by your intent to do it. Let’s give two examples that are related to the above. Let’s say you save a kid’s life. But you do it accidentally (for example, you happen to be walking down the road when you see a kid who’s been knocked out. So you call the ambulance). GOOD = 10 (you’ve saved a kid’s life). INTENT = 3 (you basically just happened to be in the right place at the right time). So even though you’ve done something really good, you’re probably not going to get all that much karma because all that happened was you were in the right place at the right time. You save a friend’s marriage. You do it because you really care about them and their relationship. And you put a ton of effort into doing it. Here you’re actually getting more good karma than the person who saved a kid’s life because you did it on purpose and it took real effort. Karma is about the good or bad you do, measured against your intent to do it. If you have harmed people by accident, chill. It was not your fault. Nothing that bad will happen. So if your lie does a lot of damage and you lied intentionally, you will get back karma from lying. If your lie does no damage at all and you only lied because you had not choice, you will not get any bad karma from lying. 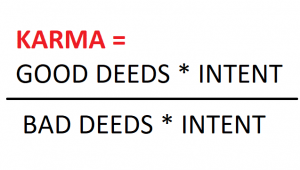 So if you are trying to workout whether you get bad karma from lying, use the equation. Good / Bad divide by volition. Do you have good or bad karma? Inevitably, we are all going to do some good things and some bad things. And no is 100% pure evil. So how do you know if you have good or bad karma overall? To put karma in far too compact a nutshell, it’s about the good deed done and the intent of doing those, measured against the bad deeds done and the intent of doing those. If you’ve done as many bad deeds as good, with the same intent of both, you’ll round out in the middle. Or you can fall either side of that. The law of karma is immutable and ever present. It is a law that cannot be broken. And it is essential. Let’s look at the scientific evidence for karma. In 2011 York University in Toronto conducted research into the effect of kindness. You can read about their research here. 700 people took part in the study a study to see whether being nice to other people had a significant effect on our health. The group practiced acts of compassion towards someone for 5 – 15 minutes a day. Lead author Myriam Mongrain, associate professor of psychology at York’s Faculty of Health tells us that it only takes a few moments of kindness to have a lasting effect. “The time investment required for these changes to occur is so small. We’re talking about mere minutes a day,” she says. You’ll probably want to read all about the effects of kindness in our Loving Kindness Meditation guide. Kindness improves self esteem and happiness and reduces levels of depression. Click the link above for more on this. Kindness makes us feel better about ourselves, which makes us value ourselves more. This in turn makes us see more purpose in our lives. And that motivates us to act in positive ways. So good deeds do ultimately result in a better future. In other words, the basic concept of karma is scientifically proven. Karma exists. So how do you have good karma? You start by stopping bad karma. Both good karma and bad karma exist for a reason. They are the wheels through which all things return to us. They are the life lessons we must learn. If you’re an empath, intuitive or sensitive type, you may already know whether you are experience bad karma. It can feel like an invisible blockage in our energy. It is as though something is holding us back but we do not know what. Often, it is bad karma. Bad karma holds us back. Clearing bad karma is the key to moving forward. Being unhappy at work or in a relationship. Feeling bad about something but not knowing why. Dwelling on the past and blaming the past for negative energy in the present. The feeling or ideas that things would be different if only we could learn or recognising some pivotal point. Being rude to someone. Feeling upset. Taking something that didn’t belong to you. Being robbed. Being selfish, and having people ignore you. Of course, there is bad karma for cheaters, too. There are many ties between karma and money, too. Theft gives you bad karma and when we are robbed it can also be the result of our own bad karma. (don’t worry, if you have bad money karma the tips below will help. One of the most famous karma examples in history is Schindler, who risked his life to help Jews in World War II and was immortalized as a hero because of it. Many people ask about lying and karma. Does lying give you bad karma? Depends. Was the lie with good intention or bad? If the intention was good it will produce good karma. Karma is all about actions. Right actions in the past become positive karma in the present. Right actions in the present convert to positive karma in the future. Right actions, the majority of the time, translate to: compassionate and kind deeds with good intention. Here are the best ways to get good karma. It costs nothing to give a compliment. But the right words can mean the world to the other person. I remember when a friend told me I was a great person because I spent so much time helping stray animals. Just hearing that gave me validation and it made me feel special. That kind of feeling can’t be bought. The right compliment will generate a lot of good karma. One of the best ways how to get rid of bad karma is to practice random acts of kindness. We’ve already looked at how kindness creates happiness and increases self worth, as well as how it lowers depression. Personally I love spending just a few minutes every day being outrageously kind to someone. It makes me feel absolutely amazing. And it puts a smile on the other person’s face too. Total win / win. There are always opportunities to help other people. And those are also opportunities to build good karma. We need to take a look around at other people and ask how we can help them. When can we do to make a difference in their lives. Then we need to act. A powerful way how to get rid of bad karma is to forgive. Good karma can come from positive actions, and it can also come from noble thoughts and feelings. One of the most noble traits in the world is forgiveness. Take a look at how forgiveness benefits us. The positive effects of forgiveness are truly astounding. The harder it is to forgive, the more karma you will generate when you do forgive. Find someone who needs forgiveness? And have the compassion to forgive them. One of the reasons why people love to donate to charity is because it makes them feel amazing. And of course, the right charity also helps those in need (though many do not; that’s a subject for another article). Donating to a great charity will create good karma in abundance. And remember, you don’t have to donate money. You can donate food, clothes… whatever you have to spare. This is one of the best ways how to get rid of bad karma and build good karma. Another positive mental trait that creates karma is gratitude. Simply telling people that you are thankful can be a big deal. I remember when a friend of mine was going through depression. His family were not supporting him. He had no one to turn to. So I did everything in my power to help him. Afterward? He told me that he was so thankful that there are people like me in the world. That felt amazing. And it generated a lot of good karma for both of us. Sometimes just saying thanks can make a world of difference. This is the easiest way how to get rid of bad karma and build good karma. The more something means to you, the more karma you will receive when you give it away. The item you give away doesn’t have to be of monetary value. It could be a personal item that has immense value to you, like a family heirloom. Passing that item on to someone else who needs it, or who will value it, will generate huge karma. It stings a little to give such a prized possession away, but it sews the seeds of karma, and we all know how fruitful those seeds can be. Teachers usually have good karma. Because sharing knowledge is one of the main ways to build karma. If you don’t want to or simply cannot give away a possession or make a donation, you still have a lot to offer. The knowledge you’ve accrued in your lifetime is of immense value to someone. Find that person and pass on all the knowledge you have sitting up there in that brain of yours. This is a rewarding way how to get rid of bad karma. Dreams. They make the world go round. Or is that love? I know. How about we combine dreams with love. Find someone who has a dream, or an ambition, and lovingly help them achieve it. 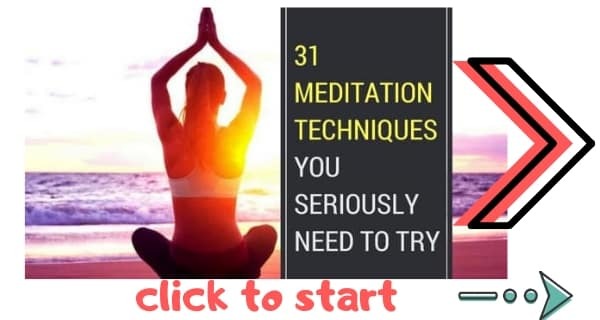 Seriously, if you do this you will feel bloody amazing and it will create so much good karma you’ll be sitting on cloud nine the rest of your life. And that is how to have good karma. How do you stop bad karma? Bad karma is caused by bad deeds. And a lot of the time, bad deeds are caused by anger. The less anger you have the the less bad karma you will have. Practicing relaxation techniques like meditation will lead to less anger. That in turn leads to less bad deeds, and finally less bad karma. It’s basically the opposite of the Yoda quote. You remember the Yoda quote, “Fear leads to anger. Anger leads to hate. Hate leads to suffering”? It becomes this: Hope leads to happiness. Happiness leads to love. Love leads to heaven. Start with inner peace. Then the bad karma will take care of itself. Stopping your anger is one of the best ways how to get rid of bad karma. It’s never too late to say sorry. And when you say sorrow you will stop bad karma from the deed you’re apologising for. Saying sorry has a transformative effect. It stops the damage of past mistakes. It lets the other person know that they matter, and whatever mistake you made that you are sorry for it, and it helps you to move on. “Sorry” is a truly powerful word. Bad relationships happen. Grapes turn sour. It’s inevitable. Clinging on to a broken relationship is never the right answer. Bad relationships create negative karma. Stop the flow of bad karma, and turn the page. The idea of an eye for an eye is just… ignorant. If someone does you wrong, their own bad karma will punish them. There’s no need for you to punish them yourself. Doing that will create bad karma for you. Enlightened people, when wronged, forgive the other person. That stops the flow of bad karma and gives the enlightened person positive karma. Accept that the other person made a mistake. Let their own bad karma punish them. Don’t mess up your own good vibes through one stupid act of vengeance. Loving kindness meditation will completely stop bad karma. Because it’s basically a steroid for positive feelings. 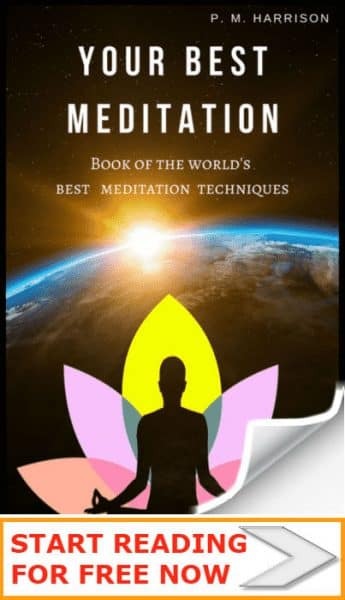 Take a look at this guide to Loving Kindness Meditation. It’s a real game changer. This is the best meditation technique for karma. Shinnyo Buddhists practice Buddhism as a way to live in a state of nirvana. They enjoy inner peace and purity continuously. They strive for their own inner peace, and for the inner-peace of others. Shinnyo Buddhists claim to have found the true meaning of The Great Nirvana Sutra, which is the Buddha’s last teaching. They believe that all mankind can be saved through this teaching, and that compassion is the key. Accepting life as it is. Having gratitude for both the ups and downs of life. You can learn more about the beliefs of Shinnyo-en Buddhists in Shinjo: Reflections (get it on Amazon), which is one of the best books on Shinnyo-en Buddhism. Want to try Shinnyo Buddhism now? Here are five Shinnyo Buddhist beliefs that can stop negative karma and bring positive karma to flow. Letting go is one of the best ways to be mentally strong and happy. 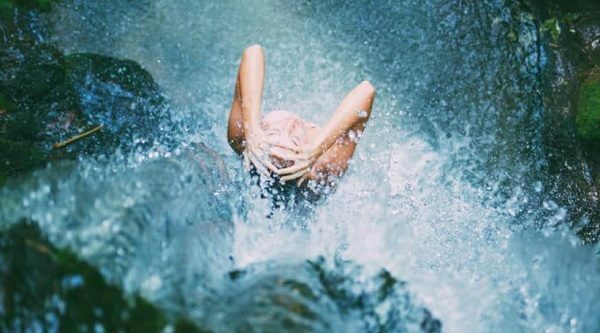 When we let go of our expectations, of our demands, of our desires, and of our cravings, we come to appreciate life for all that it is. The simple act of letting go helps us to connect with the moment, making us more mindful of the world around us, and putting us in contact with now. The key to letting go is present moment mindfulness. But how does this help with negative karma? Karma is a life lesson. It teaches us what we need to know. Trouble is, when we’re too caught up on how we think things should be, we don’t pay attention to what life is trying to teach us. Let go of your perceptions. See what the world is teaching. This will help the mind to absorb our karmic lessons, helping us to move on to a new day. Negative karma is usually the result of a lack of compassion in the past If we acted in selfish way, or in ways that harmed other people, life will teach us to change our ways by giving us bad karma. When we act in compassionate ways and help other people, life will show us the good of our actions, and it will do this through positive karma. Be compassionate for all and life will reward us with good karma. In Shinnyo meditation is very important. One of the best types of meditation techniques for compassion (and for good karma) is Karuna. When we fail to accept life as it is we create a karmic loop. We refuse to accept life as it is, so we keep acting in negative ways. The universe responds by producing negative karma. And we react to that negative karma in the exact same way. It’s an infinite loop that does not serve the universe and does not serve use. Accept life as it is. Learn the lesson. Change perspective. Change attitude. The universe will acknowledge the change and reward us with positive karma. Having inner peace for ourselves is a wonderful thing. And indeed, we here at THE DAILY MEDITATION have written an in-depth guide to producing inner peace. Things get even sweeter when we produce inner peace for other people. Ask what ways we can help other people to feel peace. This benefits us, benefits the other person, and benefits the universe. The universe will respond to this by stopping negative karma and producing positive karma. We all know that gratitude is important. And it is especially important when it comes to karma. When we are grateful for life itself we see the value in all life’s moment, both good and bad. To change karma we have to learn from the past, and the only way to learn from the past is to be grateful for the experiences life gave us. We must be grateful for good and bad. Only then can we achieve all the lessons life is giving us, which is the key to controlling karma. Living life with the right attitude is the key to removing bad karma. And the right attitude is compassionate, kind, grateful, and mindful. I hope you’ve enjoy this look at karma. If so, please share this on Facebook and Twitter so I know to produce more guides like this. Thanks. You now know how to get rid of bad karma and hot to build good karma. When we stop the flow of bad karma and cultivate good karma, only positive can come. Do good deeds today and reap the benefits tomorrow. It’s one of the few rules all religions and science agree on. So let me ask you: How’s your karma?